Ratikant Mohapatra presented this paper on "What is a Guru" for the seminar and panel discussion in San Francisco for the Traditions Engaged festival in Oct 2010. For centuries the word 'Guru' has been used in India, sometimes familiarly though always with reverence. The idea of a Guru rests in our consciousness as something larger than life - much larger. In the contemporary worlds of education, culture as well as cults and Godmen, and in the ivory-towered establishments of advertising and the behavioural sciences, the "concept" of a "Guru" has found comfortable currency. And even in the West, 'Guru' - the word - is now part of an international vocabulary. Closer home, in counter-culture locales like the Bombay Film Industry and the Delhi poetry-reading circles, that small word of 4 letters has come to define a universal image and phenomenon; a definition that is quite distant from the one that our Vedic forefathers gave to the word "Teacher." The word Guru has come to stay, universally, through its manifold meanings, implications, cadences. As for my own experience with the word, I would have been at a loss to define "Guru" in a comprehensive way if one stopped me on the street and popped the question - what do you make of the word "Guru"? What exactly does it mean! But after getting to know Guru Kelucharan Mohapatra a little closely, for many years now, ¬and after meeting a few people like him in various corners of India, I am now rather comfortable with the idea of a guru and through this - "The idea of India." Few nations have been able to produce such extraordinary teachers; such teachers combine in themselves the formidable skills of the topnotch performing artiste, a roving ambassador of art and culture, the revered teacher, and the family man with awesome responsibilities of bringing up talented children as well as a teeming number of talented students! Add to this a gruelling international travel schedule with performance deadlines, year after year after year. The picture that emerges is of a man possessing a fine-tuned balance of enormous talent, temperament, good values, and an ability to give of oneself continually, generously. Such people have an awareness of others; they love to nurture lesser human beings (sometimes in their own image); such people are rare, anywhere in the world. Such people have perhaps achieved a form of godhood. Of such stuff, then, is a "Guru" made. Apparently 'Gu' in Sanskrit means darkness and 'Ru' represents illumination. A teacher thus, leads his disciples from darkness to light. And India is a blessed country in having produced in every Age, Gurus who have been in themselves the "akshya patras" of knowledge, and its transference, have assumed the burden of parenting those left in their care; the Guru is both mother and father at once; the purveyor of kindness and mercy as well as the imposer of firmness and discipline - all in the rigorous service of the Arts and its divine skills. Hence perhaps "Gurur Brahma, gurur Vishnu, gurur devo Maheshwara." And India is rich, because its gurus have risen from among the common people, the rusticity of village life notwithstanding, the absence of benign patronage and opportunity notwithstanding, the misery of poverty and lifelong stress notwithstanding. Of such material is wealth made, the unconquerable richness of spirit, the undying devotion to knowledge and art, the unparalleled excellence of inspired teaching throughout a life of grace and sacrifice. This then was India. The nation has given the world 3 great streams of classical music, a number of rich classical dance systems, innumerable folk art, music and dance forms, enormously variegated culinary traditions, herbal medicine expertise, a caring attitude to plants and animals, a love of learning and the community enjoyment of song and dance, a feeling for household decor, bewildering in its simplicity and variety, a forgiving attitude to its invaders and enemies, a living style enhanced by a consciousness of things spiritual. The "Historical imperative" that India experienced in the Middle Ages saw, nevertheless, the blossoming of the Guru-shishya traditions of the Vedic age. The symbiosis between the teacher and the taught, the sensitivity of the child disciple to the aging Guru's needs, these find expression in various texts, shlokas, proverbs. But nowhere has this relationship been more beautifully expressed than in the Sanskrit invocation "Om Sahana Bhavatu" oft quoted by Guru TKV Desikachar (the renowned engineer turned yoga exponent of international fame). This simple and moving verse explains the Guru-Shishya relationship in a universally complete way. so that this relationship flowers"
After all, the learning process binds the teacher and his pupil to an "Upanayanam"- the act of leaving one's child in the care of someone precious. There is trust involved here. The good teacher invariably watches for the time when the pupil is ready to receive knowledge; the evolved Guru never rushes to answer every premature question that the shishya might inflict upon him. We emerge from the darkness of the womb to the light of the world. The Guru leads us from the darkness of ignorance to knowledge and possibly wisdom. Yet the role of the great teacher is never easy: the word "Gurutwam" also means the heaviness of oppression, which would stifle the inquisitiveness of a bright shishya. Hence the light to be revealed to both student and Guru, simultaneously, in the "transaction" of learning. All this taken as read, dear friends, where does Guru Kelucharan Mohapatra come into this? 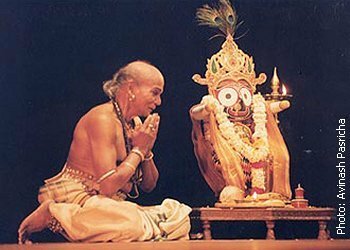 In my view of the world, Kelucharan Mohapatra fits the definition of a Guru very substantively. 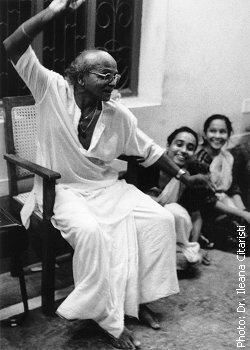 In fact in my mind, Kelucharan Mohapatra occupies the exalted position of an "Acharya," the Guru to whom other Gurus defer. 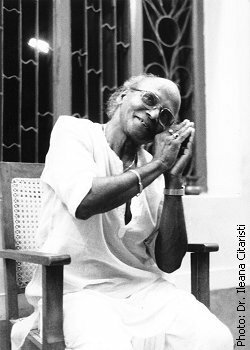 In large measure, Kelucharan Mohapatra possesses a unique flavour of kindness, a fragrance enriched by compassion that throws light on other human beings, an understanding of the world that easily puts people above petty concerns, a spontaneous mix of firmness and tenderness ¬- that very few people are blessed with and very few teachers can manage in their lives. 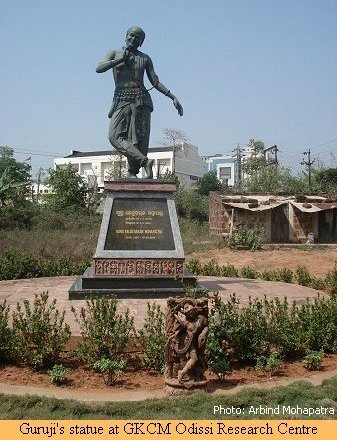 A Guru in body and mind, gifted with a soul that encompasses the world within his frail embrace; a consciousness that looks, simply and directly, at the all too prevalent human frailities, be they in the life of dance and music, or the vast expanse of untutored life that lies beyond the realms of creativity. The ultimate and incomparable beauty of expression in anything that he touches. Truly the Guru of our times.